Preventive dentistry encompasses a modern approach to providing dental treatment. Our goal in providing preventive dentistry is to educate our patients in the optimal way to maintain their teeth and to recommend treatment aimed at stopping problems before they start. Dental disease arises as either dental caries or periodontal disease, both of which can be prevented with good oral hygiene, dental prophylaxis and other modalities that are customized to suit each individual patient’s needs. Preventive dentistry entails regular checkups, cleaning, x-rays and more to ensure that your mouth is healthy. This is a great way to avoid cavities, gingivitis, and much more. You should see your dentist twice per year for a cleaning and exam to check for any potential dental issues. Visits to the dentist are an important part of preventive dentistry, especially if you are at high risk for dental issues. Along with brushing, flossing and other healthy habits, routine dental visits keep teeth clean, strong and white. Call Neighborhood Family Dentistry of Utica, NY today at (315) 797-0030 to make an appointment! We see patients as young as infancy as well as adults. 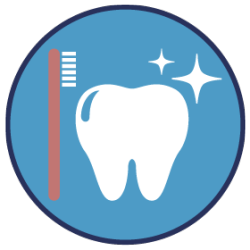 A dental cleaning or “prophylaxis” appointment will entail reviewing the patients medical and dental history and an evaluation of the gums and teeth are performed by the dental hygienist including an evaluation of the patient’s periodontal pocket depths. The teeth are then scaled both above and below the gum tissue to remove calcified dental calculus from the teeth. This will be done with hand scaling and/or an ultrasonic dental scaler for greater precision. The teeth are then polished with a high grit professional toothpaste and dental handpiece to remove any remaining soft plaque and stain. All teeth are then flossed. At the end of a dental cleaning, the teeth are completely void of dental biofilm. The dental hygienist will evaluate a patient’s homecare and give specific instructions that are fine-tuned for each patient’s specific needs. During the dental prophylaxis appointment you may also have radiographs taken (periapical, bitewing and/or panoramic radiograph or a combination). You will also have an examination by the dentist that includes and oral cancer screening as well as a caries screening and a customized treatment plan will be generated. If necessary, follow-up treatment may be scheduled with the dentist as needed. The patient may also require a referral to specialists, which we will arrange for you. The patient will be set up with a reasonable recall schedule (3, 4, or 6 months). The American Dental Association and the American Academy of Pediatric Dentistry agree that your child’s first dental visit should happen within six months of the emergence of their first tooth or by their first birthday. Neighborhood Family Dentistry proudly provides lap exams for infants and young children. During a lap exam, you are seated in a chair with your child sitting on your lap. Dr. Brown will position herself across from you as you gently lay your child’s head back onto the dentist’s lap. Dr. Brown can then evaluate your child’s dentition. Your child will be able to see and interact with you throughout the entire procedure, making the process easier and more comfortable for both child and parent. Who benefits from dental cleanings? How do I keep my teeth healthy between appointments? There are many methods involved with preventive dentistry, but the most common practices are daily brushing and cleanings. You already probably know to brush twice a day and floss at least once a day. The ADA recommends holding your toothbrush at a 45 degree angle to your gums for best results. Your diet also has a huge effect on your oral health. High calcium and protein foods like cheese, yogurt and almonds can strengthen teeth while high fiber foods like apples, carrots and celery can help to rinse away bacteria and food particles (though they’re no substitute for flossing). Avoid sugary drinks and foods: they can eat away at your teeth over time, and they’re not especially good for your anyway.